Courtesy photo by Heather Black. 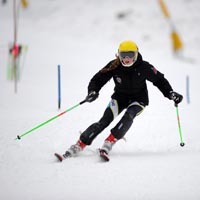 Sun Valley Ski Education Foundation alpine racer Olivia Wentzell, shown here training at Sun Valley in November, competed this week in the Eric Hays Memorial at Park City, Utah. Sun Valley Ski Education Foundation alpine ski racers fanned out to ski slopes in Utah, Wyoming and British Columbia, Canada for season-opening races this week. It was snowing Tuesday at Park City (Utah) Mountain Resort, but the younger SVSEF skiers in the U-16 (ages 14-15) and U-14 (12-13) classes ran giant slalom Monday on the first day of the Eric Hays Memorial. Seventeen older SVSEF racers ran gates in International Ski Federation (FIS) technical races Saturday through Tuesday at Jackson Hole Mountain Resort in Wyoming. Two of Sun Valley’s top racers, 17-year-olds KJ Savaria and Kipling Weisel competed this week in the Audi Coupe Nor-Am Cup at Canada’s Panorama Mountain Resort. In Monday’s super giant slalom, Weisel placed 13th of 22 in the U-18 (ages 16-17) class and 80th overall of 96 finishers. In Sunday’s super combined, Savaria was 10th of 21 U-18 racers (62nd overall) and Weisel placed 15th in U-18 (72nd). Samantha Busby and Katelyn Rathfon made their class podiums during Monday’s Hays giant slalom on Payday. Busby won the U-16 class by .18 seconds and placed third overall to winner Jaime DuPratt of the University of Utah and Park City Ski Team senior-class racer Jessica Kelley. There were 60 starters and 47 two-run finishers. Rathfon placed second in the U-14 class and was 16th overall. And, in U-14 boys, Noah Leininger won his GS class while placing 40th of 48 finishers. - U-16 boys: 6—Jay Fitzgerald. 9—Stockton Troyer. 10—Taylor Cooper. 12—Austin Savaria. 17—Duncan Fuller. 19—Trenor Gould. 23—Griffin Curtis. 25—John Blackburn. 30—Wyatt Smith. 31—Patrick Riedinger. 37—Travis Flynt. - U-16 girls: 1—Samantha Busby. 5—Haley Cutler. 8—Josie Allison. 16—Madison Milgard. 19—Alexandra Black. 22—Olivia Wentzell. 26—Poppy Ellie Vorse. 46—Grace Palmer. - U-14 boys: 1—Noah Leininger. - U-14 girls: 2—Katelyn Rathfon. Weather wiped out Monday’s men’s giant slalom at Jackson Hole, but they managed to get in the women’s GS plus four slalom races for men and women over the weekend. Podium placers were Harlan Collins (slalom) and Sofi Leroux (GS) with bronze medals in U-21 (ages 18-20), along with Jordan Fitzgerald twice with bronze in U-18 slalom and giant slalom, and Kyla Miller with bronze in U-18 slalom. - U-21 men: Harlan Collins 9-SL and 3-SL (8th overall of 76 finishers,114 starters); and Christopher Nalen 17-SL. - U-21 women: Amanda Stelling 4-SL (7th overall out of 45 finishers, 67 starters), 12-SL and 10-GS; and Sofi Leroux 7-SL (11th overall), 5-SL (8th overall) and 3-GS (3rd overall of 43 finishers, 64 starters). - U-18 men: Parker Scott 13-SL and 8-SL; Marc Leroux 16-SL and 26-SL; Cole Caulkins 23-SL; William Harder 21-SL; and Logan Shipley 28-SL. - U-18 women: Jordan Fitzgerald 3-SL (6th overall of 45 finishers, 67 starters), 5-SL and 3-GS (6th overall of 43 finishers, 64 starters); Mackenzie Bachmeier 12-SL, 30-SL and 4-GS (10th overall); Kyla Miller 3-SL (7th overall of 51 finishers, 67 starters); and Linnea Baysinger 4-SL (9th overall), 7-SL and 5-GS.